When we think of the Grand Canyon we tend to visualize expansive vistas, but it takes getting down to the canyon’s foundation to see how incomplete those notions are. Every day on the river our raft group was treated to an assortment of layered rock, turquoise pools, polished slot canyons, and plunging waterfalls that reminded us of nature’s complexity. More than simply beauty, these little gems helped all of us appreciate the intricate, inexorable processes that formed the Grand Canyon, and that are constantly work across our planet. Deer Creek Fall lands less than a stone’s throw from the Colorado River. 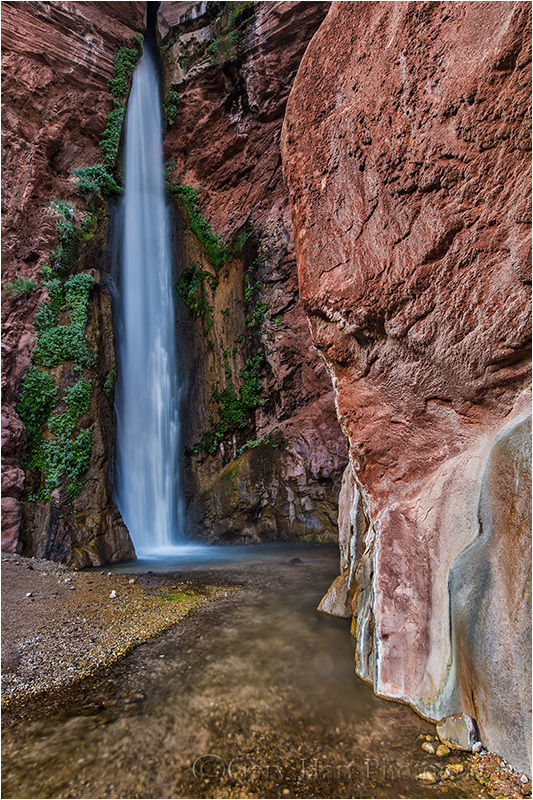 Not only is it pleasing to the eye, Deer Creek Fall provides a great opportunity to understand the some to Grand Canyon’s extremely complex geology. Most of the red rock you see in this image is Tapeats Sandstone, deposited beneath an ancient sea over 500 million years ago. This rock wasn’t exposed until the region was uplifted and carved by the Colorado River, most likely in the last 5 million years (that timing is still subject to debate). What’s most intriguing to me here is the red granite, an intrusive igneous rock injected beneath the Earth’s surface about 1.7 billion years ago. But near the top of the fall are the discernible layers of sandstone. When we see two types of rock immediately adjacent to each other, it’s easy to forget what that interface represents. In this case we have 1.7 billion year old granite underlying 550 million year-old sandstone. What’s missing is 1.2 billion years of geological history. Dubbed the “Great Unconformity” by early Grand Canyon explorer John Wesley Powell, over a billion years of Earth history was erased by processes we can only infer by observing other geological features nearby, or similar rock deposited elsewhere. To comprehend how long 1.2 billion years is, and all that could have happened during those missing years, consider erosional (wind and water) and uplift (volcanoes and continental collisions) processes that add or subtract just one foot of elevation every thousand years—a little more than an inch every 100 years. (The San Andreas Fault races along 10 times that fast, at an average of about 12 feet every 100 years.) Do the math—at a foot every thousand years, 1.2 billion years would be long enough for a mountain range the elevation of the Sierra Nevada (14,000 feet) to rise and completely erode to sea level over 40 times. Just a little perspective for the next time you think your barista is taking too long with your latte. 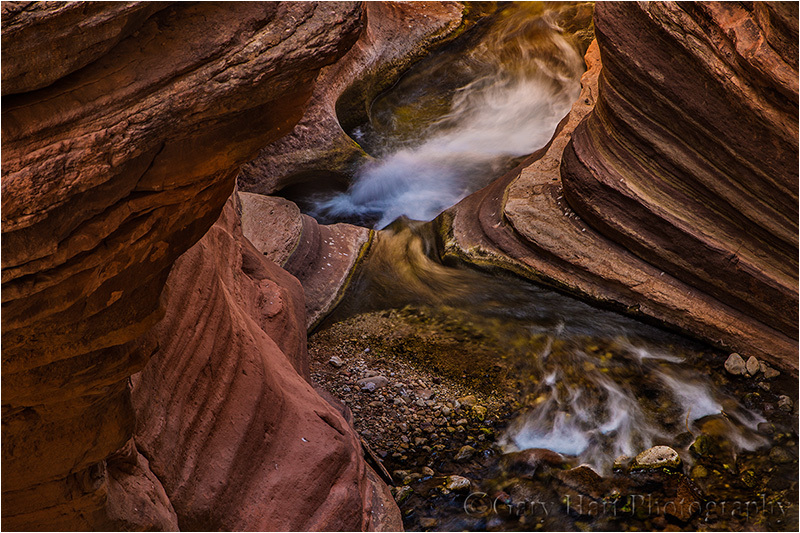 Unlikely as it may appear in the arid Grand Canyon landscape, Deer Creek Fall springs like a magic fountain from red sandstone, dropping over 100 feet and scurrying into the nearby Colorado River. The jade green pool beneath the fall, echoing with a jet engine roar and fringed with mist, was a refreshing elixir to our weary band of adventurers. We pulled up here toward the end of our fourth day of careening through a seemingly endless series of intense rapids (with harmless sounding names like Ruby and Lower Tuna), making the opportunity to recharge in Deer Creek Fall’s cool-but-not-cold pool a welcome respite. Some in the group hiked to the top of the serpentine slot canyon feeding the fall (a story for another day), others danced in a rainbow beneath the fall. Direct sunlight made photography difficult at first, but by the time I returned from the hike to the top the entire fall was in shade and I went to work. I started on the left side, looking straight up from as close as the spray allowed me. I soon crossed the creek and move a little farther back. When I was done I set down my gear and hopped in the pool beneath the fall for a most welcome shower. We were back on the river a few minutes later, refreshed and giddy about our good fortune to have witnessed this natural marvel up close. I’m doing it all over again in 2015 (May 11-18)—contact me if you’d like to join me. ← Inside the Grand Canyon: Are you a cook or a chef? Thanks, Cathy. Yeah, Kauai was a blast, wasn’t it. I’m about ready to move on from the Grand Canyon stuff and put up some Kauai images. Would to see you in Yosemite sometime.